iPhone games seem to come in two main flavors. There are the games with high frame rates that seek to equal the graphics and story quality of a console game, and then there are the simpler games that are better classified as time wasters. Stone Age is definitely the latter, but that doesn’t mean it’s not a lot of fun to play. 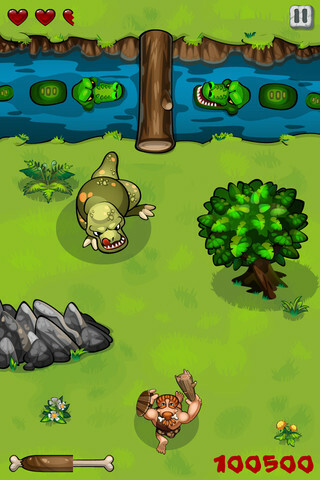 The game features simple controls – tilt the screen to avoid obstacles coming at you, tap to attack, swipe to defend. 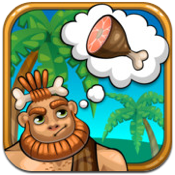 Collect all the bits of meat you can find to upgrade your caves or get other perks. It’s repetitive, mindless, but pretty darn fun to play. As you progress further, the environments change from grassy fields to icy terrain to a volcanic terrain. 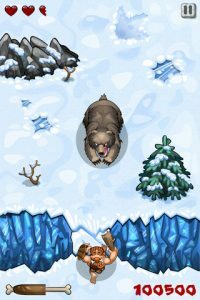 And with each transition, the animals you encounter change to reflect your location. Still, there are some issues with this fun little slash ’em up mobile game. The load time seems to be a bit excessive (even on a 4S), though it’s still fairly reasonable. Navigation controls are also a bit clunky, and it can be a little tricky to move around obstacle effectively. And some of the in-game upgrades seem a bit, well…unimaginative at best, and perhaps even a bit insensitive to some people. The “beautiful wife” is blonde and white, while the “clever wife” is Asian (and beautiful), and the “strong wife” appears to be a tall, dark-skinned woman (also beautiful). It might be reactionary to call these stereotyped female characters racist, but they will almost certainly rub some Stone Age players the wrong way. All that being said, Stone Age is a free game that’s simple to play and easy to upgrade, and that makes it worth checking out. It’s fun for all ages, and does have some degree of difficulty that makes it worth playing over and over again. Stone Age is compatible with iPhone, iPod touch, and iPad. Requires iOS 4.3 or later. A small expedite fee was paid by the developer to speed up the publication of this review.